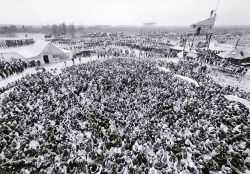 NEW YORK (LNS)—In the largest anti-nuclear demonstration that West Germany has ever seen, over 30,000 demonstrators battled police November 15 to protest the planned construction of a nuclear power plant in Brockdorf, a small town in the northern part of the country. The demonstration, the latest in a series of protests by the predominantly rural population, met with severe repression. Thousands of police used everything from water cannons, mace, tear gas sprayed from helicopters, to nail-studded planks to stop demonstrators from occupying the nuclear power site. One German TV reporter described the scene as “a concentration camp;” another spoke of “nuclear fascism.” In anticipation of the occupation, police had encircled the site with two to three-meter high concrete walls topped off with NATO wire—a special heavy-duty barbed wire used by the military. In addition, they had built a moat filled with water to prevent demonstrators from approaching the site. Behind the fortified barricade, police forces, mobilized from six different parts of Germany, patrolled accompanied by dogs. In the aftermath of the demonstration, the government attempted to pin responsibility on “leftist extremist organizations.” However, even conservative German newspapers admitted that these charges were false. Opposition to nuclear power has been growing throughout Germany, in response to the government’s increased emphasis on developing nuclear energy while ignoring the environmental consequences. In the past four years, occupations of nuclear power plant sites have become far more frequent, with one occupation in Whyl, West Germany, lasting almost a year and a half. Opposition to the power plant in Brockdorf appears to be fairly broad based. Residents of this small rural town in the state of Schleswig-Holstein say that the power plant is being pushed on them by the government, with no concern for the dangerous environmental impact. They point to the danger of nuclear accidents and the disposal of nuclear wastes. And they charge that the government’s policy of developing nuclear energy has not considered alternative sources of energy. Even conservative newspapers in West Germany admit this point and call for an intense public debate before the nuclear energy program is continued. Generally speaking, nuclear plants in Germany have been built in rural areas and usually near rivers, where they seriously affect the environment—for example, changing the air and water temperatures. In the case of the planned Whyl, West Germany nuclear plant, opponents charged that the change in air temperature caused by the plant would have destroyed the wine farming in that region, besides raising the temperature of the Rhine River, thereby killing life in the river. Situated near the Elbe River in northern Germany, Brockdorf is primarily a farming and fishing area. There is fear that a nuclear plant would have similar effects. The November 15 demonstration was the culmination of a series of protests aimed at stopping the power plant. In an official referendum the inhabitants had opposed the project by a 75% vote. But their position was ignored, as was the presentation of a petition signed by 20,000 residents requesting the government not to grant a construction permit. When the community learned in late October that the federal government was giving the go-ahead to start construction, despite their complaints and court cases, they decided to take action. The anti-nuclear movement is planning another demonstration for February which they hope will be even larger than the one in November. Related story in this issue: The Battle at Brockdorf.